I’m quickly becoming very good at meals that take 30 minutes or less. It’s weird to be in and out of the kitchen in that amount of time but with a baby at home I don’t want to spend all of my time in the kitchen. I also don’t have the time to spend making dinners that take over an hour. Some of my favorite ways to make a quick dinner are to use the Instant Pot, make sheet pan suppers, or to make one pot meals. These are all quick and easy ways to make complete meals in 30 minutes or less. 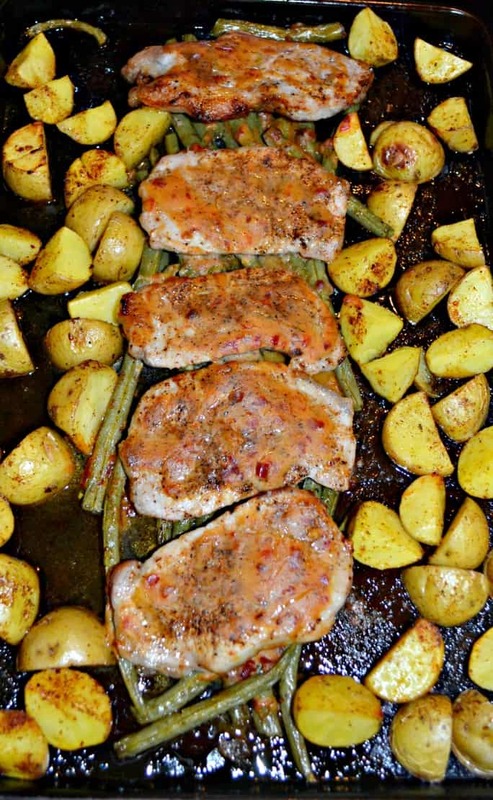 Today I’m sharing a flavorful recipe for Sheet Pan Chili Dijon Pork Chops. 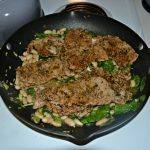 This recipe is great because I can make my main entree along with my potatoes and my vegetable all on the same pan with minimal work. 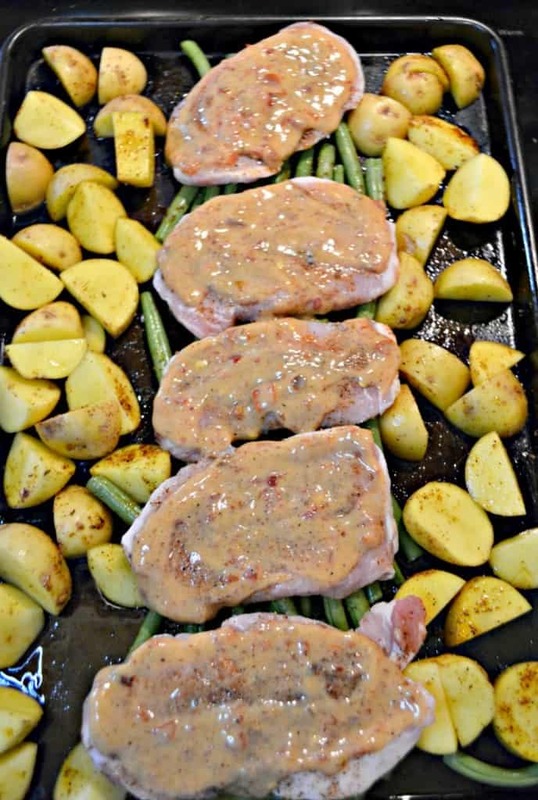 The pork chops go on the pan with a sweet and spicy chili dijon sauce and the vegetables are tossed with olive oil and spices. The entire meal takes about 20 to 25 minutes to bake. I changed around some of the spices in the spice mix and added in some things to the chili dijon sauce. This ended up being a delicious and easy to make meal. 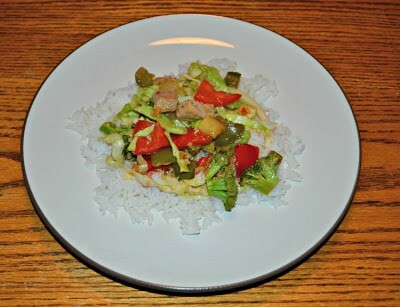 I liked that the pork was sweet and spicy and the spice mixture on the vegetables was delicious.. I’ll be honest, I would make the potatoes all by themselves as a side dish some time because my husband and I liked them so much. This is a great meal to make if you are short on time but want a lot of flavor. 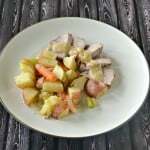 You can even change it up and use a pork tenderloin if you want to serve more people. 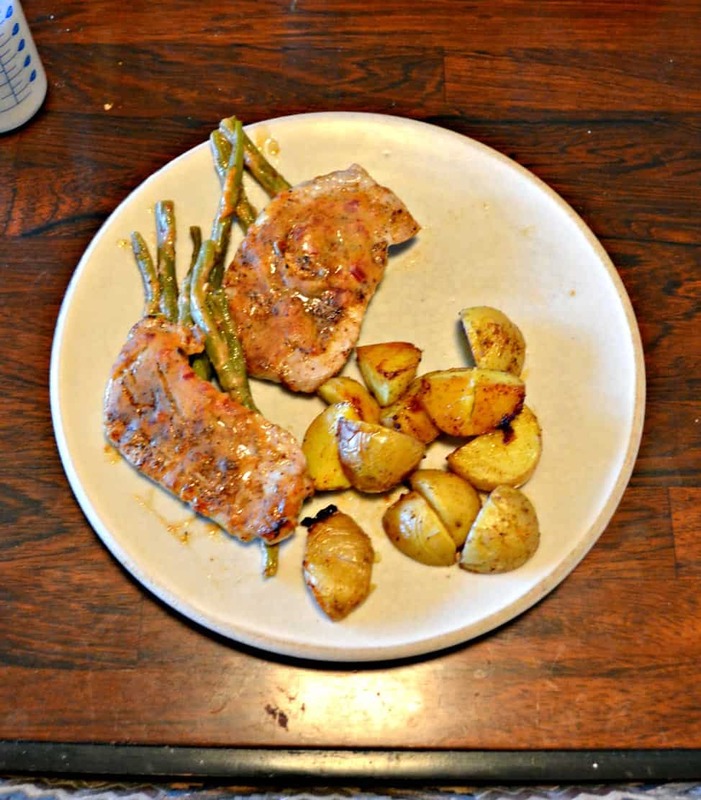 A sweet and spicy meal of pork chops, potatoes, and green beans all baked on one sheet and ready in 30 minutes! Preheat the oven to 425 degrees. Spray a sheet pan with cooking spray. Place all ingredients for the dry rub in a small bowl and toss to combine. 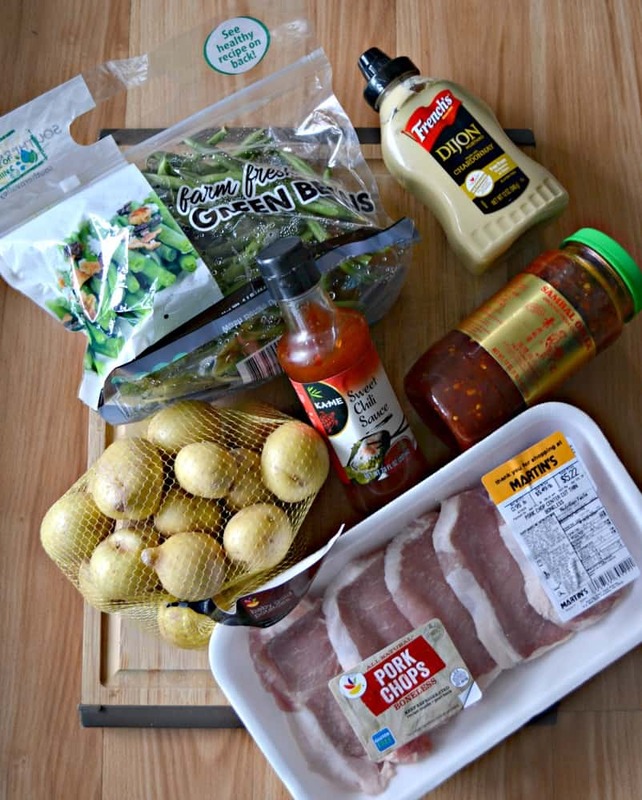 Mix all ingredients for the sauce in a medium bowl, including 1 teaspoon of the dry rub. Mix well and set aside. Place the green beans on the sheet pan and toss with 1 tablespoon olive oil and 1 teaspoon of the dry rub. Place the green beans down the center of the pan. 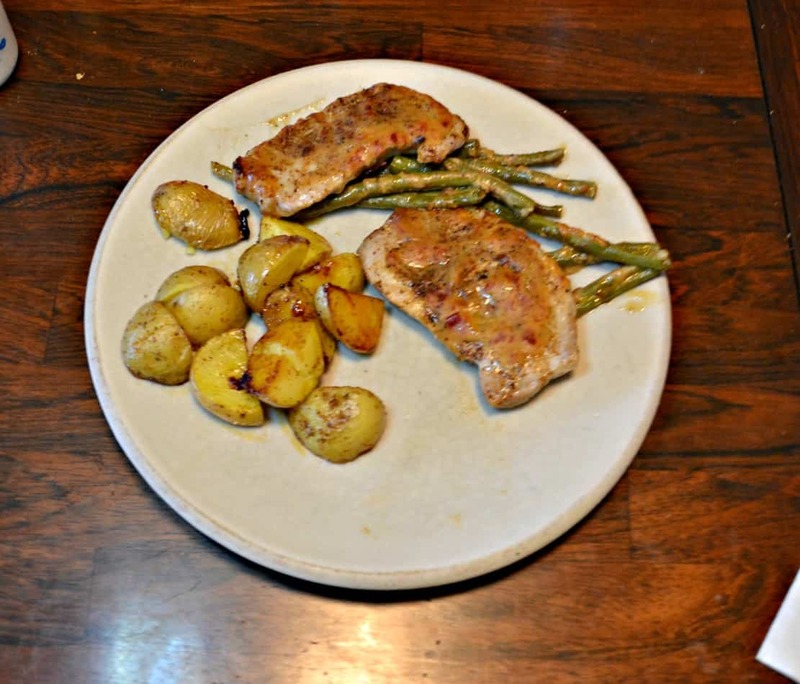 Rub the pork chops with the dry rub on both sides and then place them on top of the green beans. Spread half of the sauce on top of the pork chops and bake for 12 minutes. 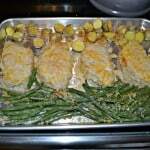 Remove from oven and flip the potatoes and pork chops. Spread remaining sauce over top of pork chops and bake for 15 minutes.